South of U.S. Route 3, west of Pittsburg Village on Bacon Road over the Connecticut River connecting the towns of Pittsburg and Clarksville. The bridge is 88'6" long with a clear span of 70'0". It has an overall width of 19'3" with a roadway width of 15'0" and a maximum vertical clearance of 12'10". The bridge is closed to traffic. Of the remaining covered bridges in New Hampshire, the Pittsburg-Clarksville Bridge is located the furthest north over the Connecticut River. The actual date of construction is not known, but there is a reference in town records that states, "In 1876, money was raised to build a bridge at Fletcher's Mill." It is assumed, by town officials, that this is the date of the present bridge. Ebeneezer Fletcher owned a sawmill - built in 1825 - near this bridge. In 1878, the Town of Clarksville was approached by Pittsburg officials "....to see what the town would do about paying the Town of Pittsburg for building two-thirds of the bridge near the Fletcher Mill. Voted (Clarksville) not to pay the Town of Pittsburg anything." This structure is one of seven covered bridges built in Pittsburg and one of three that remain standing. 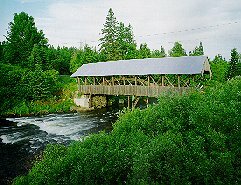 The bridge is also known as the Bacon Road Bridge. It was rehabilitated in 1974 at a cost of $6,700. The costs of rehabilitation were shared by the towns of Pittsburg and Clarksville and the state. It was closed to traffic in 1981. The Pittsburg-Clarksville Bridge is eligible for listing on the National Register of Historic Places.